Bank Street used to be called Workhouse Lane because of its main building which was the Tonbridge Poor House for over a hundred years up to the 1830s. It then became a National School and remained a school until the 1960s and then, after lying derelict, was converted in the 1980s into offices while preserving the original frontage. Kate Levick in Bygone Kent (Volume 6, No. 2) gives 1723 as the date for the building of the Poor House in Bank Street but other sources give 1726 and 1729. It certainly served to give support to the poor in Tonbridge for over a century with pauper women sitting outside the Poor House producing flax thread on spinning wheels and pauper men working inside the Poor House. A Parliamentary report in 1777 recorded Tonbridge Workhouse as providing for up to 130 inmates. A major overhaul of the national system for poor relief resulted in the 1834 Poor Law Amendment Act which set up workhouses based on `indoor relief` where the poor had to go into the workhouses to live in order to get any relief. These new workhouses were to be managed by locally appointed Boards of Guardians. The new Tonbridge Board held its first meeting on the 7th November 1835 at the Bank Street workhouse and, at a meeting a week later, the Board decided to build a new workhouse to accommodate up to 500 inmates. Land at Pembury was bought from James Alexander for £100 and the new building was completed by December 1836. The poor from Bank Street moved there, leaving the Bank Street premises empty. 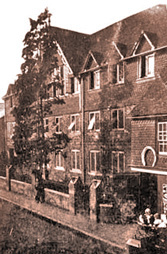 The Pembury Workhouse buildings eventually became part of Pembury Hospital. After the last of the paupers moved from the Bank Street Poorhouse to the Pembury site, the building was adapted for use by the National Society for Educating Children. The Parish Church vestry minutes for June 11th 1841 show that a tender on behalf of the National Schools for a 30 year lease of the building at £20 per annum was accepted. Although known as the ‘National School’, it was effectively controlled by the Parish Church and run as a church school. The original two storey building was enlarged by adding a further floor and the frontage with gables and hung tiles created that is still its appearance today. The school opened in January 1845 initially for children aged between two and seven and then later that year for older boys and girls. A small fee of two old pence (less than 1p) per week had to be paid for each child until 1870 when fees were abolished. 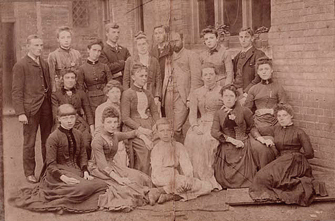 By 1860 there were 170 on the school roll but many did not attend regularly. The school log recorded pupils being kept away for hop picking, helping parents at home or caring for younger brothers or sisters. The teachers at this time were paid about £30 per year with help given by paid monitors and pupil teachers. Pupils were taught under the "payment by results" system which meant that the government grant the school got was based on how well their pupils did in front of school inspectors in a variety of tasks. This created much stress for both teachers and pupils. 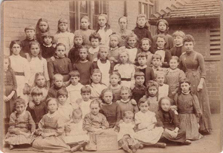 Pupil numbers increased steadily during the nineteenth century, making conditions in the school more and more crowded and outbreaks of disease more common. In 1893 in fact, the school was closed for a time due to an outbreak of scarlet fever. Finally in 1907, the boys were transferred to the new Slade School which gave the girls more room, although by 1910 there were still 250 girls on the roll and some teaching was done in the upper rooms. This however soon stopped when an inspection reported this as a fire hazard. One notable teacher was Miss Minnie Rowe who taught at the school for 40 years from 1888, the last 25 years working as Headmistress. 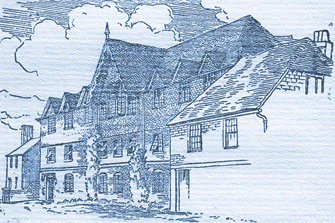 During this time, in 1919, the Kent Education Committee reported that it was one of the best kept schools in Kent. One interesting name in the school log book for this period is a Mr Charles Harvey of the Kent Band of Hope. He lectured the children on the effects of alcohol and the importance of hygiene. His name first appeared in 1898 and he is still referred to in 1931 in that capacity! By 1946 it was possible to use only the ground floor for any purpose and there were 272 pupils on the roll, crowded into seven rooms and using only two playgrounds. Finally, in 1964, when Woodlands Junior School opened, all the pupils were transferred there. In 1966, the old school was closed and it remained empty for sixteen years. The building suffered from vandalism but a conservation order was placed on it and in the early 1980s, it was refurbished and converted to office use, while keeping its external appearance. It is currently occupied by a firm of solicitors. >More history on the Woodlands School website. >Details and pictures of the later Tonbridge Workhouse at Pembury are on the very comprehensive Workhouses site.